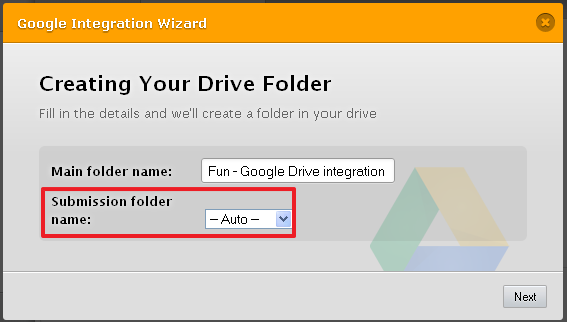 I'm afraid that this isn't possible with our Google Drive integration at the moment, but we can forward it to our developers as a feature request for possible inclusion in the future. As it is right now, whatever you choose as Submission folder name will be the name of both the folder that holds this submission, and the name of the PDF file of that submission. For this reason, you should ensure that the field you select as Submission folder name will always have a unique entry from each of your users who submit the form. Please let us know if this is the case, and we ill be happy to forward your request. However, I must point out that we can't give any estimates about whether this feature request would be worked on any time soon, or even accepted. Thank you for confirming that I understood it correctly. I have forwarded your feature request to our developers. As said before, we can't give you any estimates on when or if it might be implemented, but we will make sure to let you know through this thread as soon as such a feature becomes available.